Nicole Sosebee holds a newborn goat for her daughter Emma at her farm, Edens Lilly Farm and Dairy, near Progeso. Sosebee makes and sells goat cheese, milk and other goat based products, and lives a close to a self sustaining life on the farm as possible by eating what is in season and processing her own meat on the farm. She also home schools her three children, wanting them to grow up on the farm as she did. 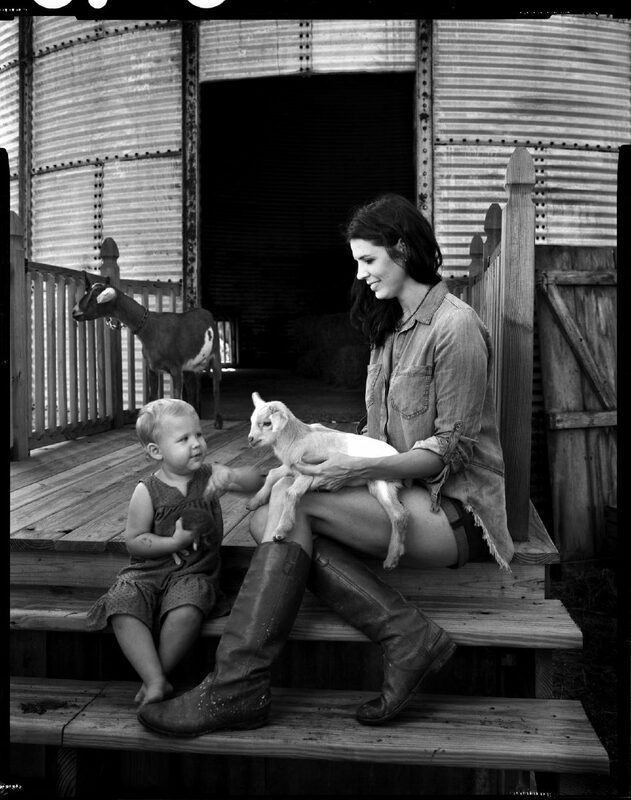 Nicole Sosebee traded her Downtown Dallas fashion industry job for a down-home lifestyle to raise her three children among farm animals and South Texas sunsets. Off an unmarked road, tucked away between crops and county roads near Progreso, lies Edens Lilly Farm & Dairy — a homestead and business owned and operated by Sosebee, a mother of two boys and a girl, and her husband Jake. The hidden treasure, reminiscent of Magnolia Market in Waco, but not nearly as commercialized, was indeed a fixer upper when the Sosebees bought it from its previous owner, who was not able to maintain the land. It also once belonged to her maternal grandparents and had been in the family for generations. The small-scale dairy farm, which took a few years of sacrifice and savvy budgeting to buy, doubles as a hands-on classroom for her homeschooled children. Sosebee, her husband and children temporarily lived in a trailer home before they saved up enough money to purchase and revamp the family farm. The 31-year-old crafted clothing and also worked for Madewell, a women’s clothing store and fashion line, after attending the Art Institute in Dallas. But the fashion industry did not sway her from home permanently. Farm-life drew her back to the Rio Grande Valley. Speaking in a matter-of-fact manner over cows mooing and goats bleating nearby, she said Edens Lilly Farm serves as a way for family and customers alike to understand the origins of food. “I feel like it’s really important to be connected to the land,” Sosebee said while sitting atop wooden steps leading up to a steel silo. Sosebee, a millennial, said recent and upcoming generations haven’t experienced as much farm-life. Introducing a younger crowd to life on a farm has been a goal because many have “zero connection” to the food on their plates, she said. Sosebee and her husband — who she met in high school while at the Rio Grande Valley Livestock Show in Mercedes — open their home to others, including to at least one college student they met through church. The student works on the farm in exchange for having a place to stay while completing school. Located off Sky Soldier Road, the farm is self-sustaining and animal-welfare approved by A Greener World, an organization that offers guidance on creating a sustainable livestock farm. The approval denotes that products produced “come from farm animals raised to the highest animal welfare and environmental standards,” according to the organization’s website. Standards for the distinction include a pasture or range for animals, and dairy goats must “develop positive relationships between the farmer and animals through gentle handling,” among pages of other requirements. Though Edens Lilly Farm is not certified organic, Sosebee said there are misconceptions when it comes to the green label. She said certifying products as organic comes with a hefty price for farmers, which oftentimes is unreasonable for smaller producers. “The cows are still in a little cement box, eating organic food,” she said of some organic farms. But that’s not the case back at Edens Lilly Farm & Dairy. “Buying locally is better,” she said. Sosebee sells goat cheese, goat and cow milk and other products directly to customers and at several farmers markets including the one hosted every Saturday by Wild August Nursery & Flower Farm in Harlingen. She also supplies cheeses and other products to local restaurants including House. Wine. and Bodega Tavern & Kitchen in McAllen. While the to-do list seems to never end for Sosebee, she typically doesn’t take a day off from work. She attributes her knack for working outdoors from her father. This weekend, the Sosebees hosted a movie night in the silo where couples watched a movie and were able to take wine to enjoy while covered in vintage quilts. Tickets were $45 a couple. They also host private tours of the farm, fermenting sessions where guests learn how to make kefir and kombucha and soap making classes, among other year-round events. They sell goats milk soap, shampoo, laundry detergent, pet products at their market located on the property near their garden where vegetables and herbs are grown. Sosebee, who thought about becoming a teacher at one point, will also host a summer sessions on the farm for children. She keeps her kids involved in the business, reminding them of life lessons and enamored by their curious minds. “If I have to bale hay, that’s fine with me as long as I have my kids working on it with me, and we’re outside, I’m good,” she said.